Some days or weeks are imprinted in my memory forever and this was certainly one for me. Wednesday evening I received a call from my editor. I assumed that the call was simply to talk over the logistics of my upcoming radio tour, but it was much more than that. She put me on speakerphone and the whole team was gathered in the room cheering about the exciting news. It was a moment I will never forget. I still can’t believe it! None of this would even be remotely possible without your support. Thank you for telling others about the cookbook, sharing pictures on social media, posting reviews, and believing that vegan recipes are something to be excited about! Many of you have told me that you gifted copies to family and friends and that couldn’t be more exciting to hear as an author. I feel so inspired to keep creating and I have so many fun ideas spinning in my mind for the future. Anyway, the NYT list will appear in the Sunday April 6th paper. I’m going to try to locate a copy somewhere in the GTA! I couldn’t think of a better time to indulge in a pregnancy craving! As if I needed an excuse. 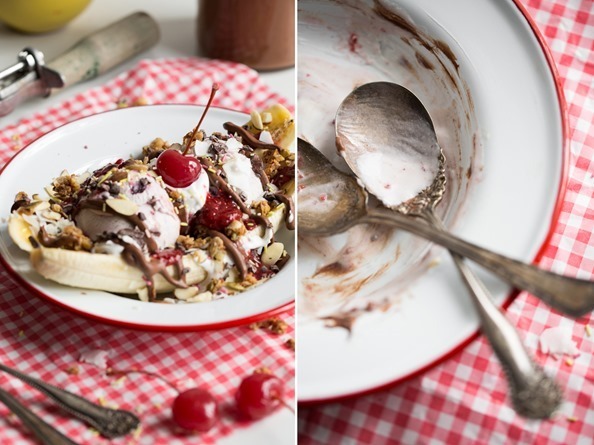 To be honest, I’ve been all about the savoury/salty cravings lately (such as my Lightened Up Crispy Baked Fries), but when I saw Cara‘s banana split recipe I made a mental note to make one as soon as possible. I think I even had a dream about it! 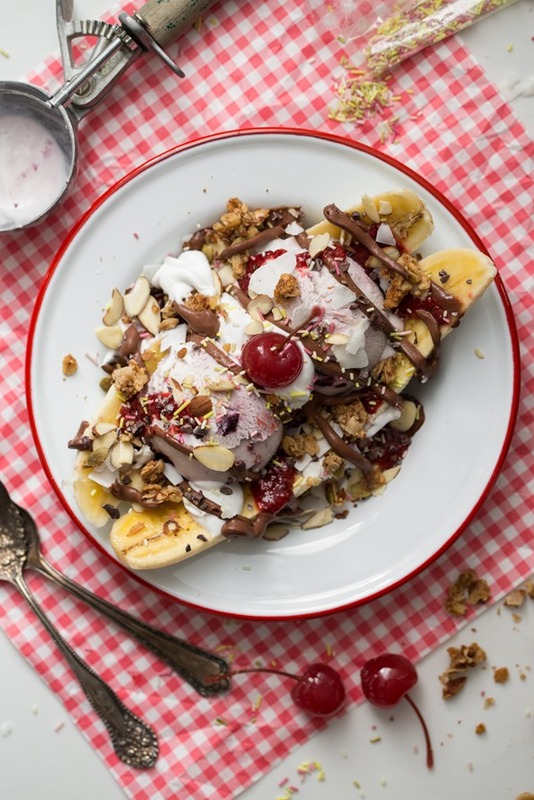 This vegan banana split is a lovely special dessert for two. One dish, two spoons...what could be better? Feel free to change up the toppings as you see fit. I’ve included what I used below, but I didn’t bother putting specific amounts so just add as much as you’d like. 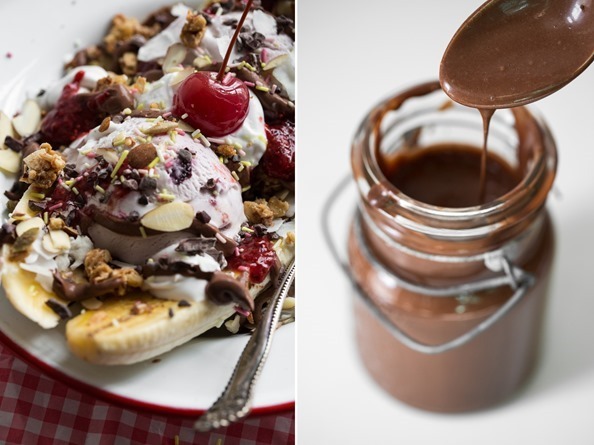 The chocolate date sauce is not to be missed. Even if you just make one thing out of this recipe, make the chocolate sauce. It’s amazing on ice cream or just by the spoonful. I expect it would be great on top of brownies too. 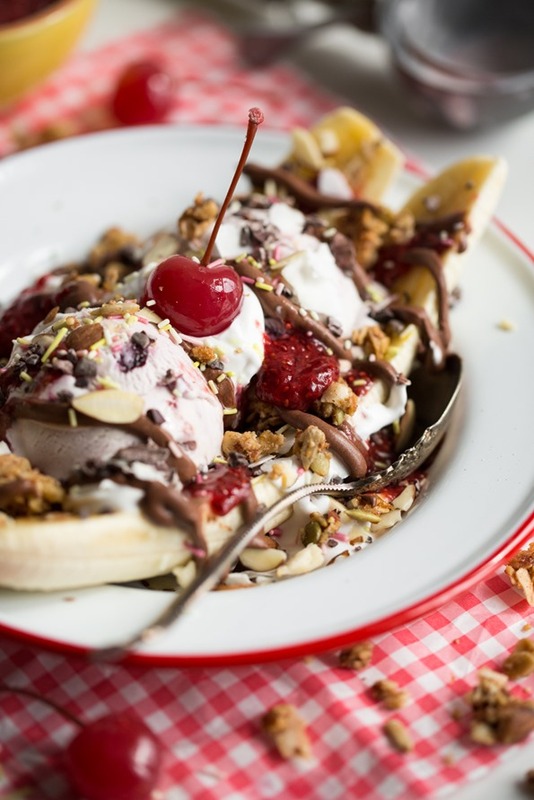 The banana split is inspired by Forks and Beans and the chocolate sauce is adapted from Southern In Law. Soak the pitted dates in a bowl of water for 30 minutes, or until super soft. Drain. You can probably skip this step if you have a Vitamix and are using soft dates to begin with (I did). Add all the sauce ingredients into a high speed blender (including the entire can of coconut milk). Blend on high until super smooth. Adjust to taste, if desired. If it's not sweet enough you can always add more pitted dates. Refrigerate until ready to use. It will firm up in the fridge a bit so you can melt it over low heat on the stove top if desired or just enjoy as is. Store in the fridge for up to 2 weeks. Prep all of your desired toppings in advance. Place the sliced banana in a large oblong bowl (or simply any old bowl will do!). Add a couple scoops of ice cream and a dollop of coconut whipped cream. Add the rest of your desired toppings and enjoy immediately! For the Coconut Whipped Cream recipe, see this post. 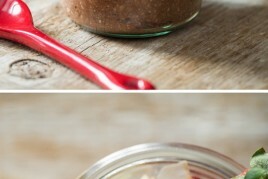 For the Strawberry Chia Seed Jam recipe, see page 287 in The Oh She Glows Cookbook. For the Ultimate Nutty Granola Clusters recipe, see page 31 in The Oh She Glows Cookbook. The brand of all-natural maraschino cherries I used is Tillen Farms. The brand of all-natural sprinkles I used is Let's Do Organic! Note: If you’ve posted a review be sure to tweet me the link and I will add it to my list! Last but not least, thank you for your comments on this week’s baby news post and for making a special time even more exciting for us! I was especially happy to read that many of you are also expecting a baby this year (and some close to my own due date). Congrats to all the mama-to-be’s! Will you be doing any book signings in the GTA? CONGRATULATIONS again Angela – what exciting news! I am not surprised – your book is a cut above and you truly do have the gift to both create delicious, nutritious foods and to inspire others to live a healthier life. I am just so happy for you with all the wonderfulness (sure that is a word!) you have going on in your life at this time :-). Oh gosh! I can’t wait to try this banana split!! Congrats Angela, you deserve it! Pregnancy craving are making your sweet tooth come alive and were getting so lovely recipes! 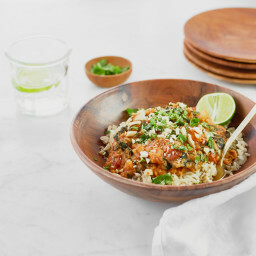 Can’t wait for more..
Congrats on the NYT list (and this recipe looks amazing)! I believe the Globe and Mail prints the Sunday Times, so you should be able to find a copy in Toronto pretty easily. Wow, what an accomplishment indeed! But also well deserved!! I’ve been cooking daily from the OSG cookbook and continue to get rave reviews from the family. I’ve got a couple books on my gift list to give to some friends this month. It’s going to blow their minds!!! such a great news :) I am so happy for you. loved how you guys celebrated it, totally worth it. Oh my gosh, that’s amazing and wonderful news, Angela! You have developed tasty and healthy recipes and you deserve this!! haha I’ve heard that happens a lot! I can totally see it. It’s hard not to get excited about food next to a pregnant lady dreaming up all kinds of wonderful concoctions. I’m so happy for you! I just ordered the book earlier this week and am anxiously awaiting its arrival. Really, success couldn’t happen to a more kind, beautiful person. and now *I* have to go make this sundae! It looks divine. Ditto Angela. Buying your book this week end. Congrats!!! Congratulations on that amazing and exciting news! Your brilliance in recipe-creation, photography, and writing is absolutely deserving of that honor! And this banana split… don’t even get me started. I think I just drooled on my keyboard. So many good things to be happy about in this post! NY times best sellers list, that’s HUGE!! and vegan banana splits, sooo good! Well, I certainly cannot say that I am surprised. As I was going on Amazon to send a copy to my sister (within the first week of the release) you were already flagged as a best seller…..”WELL OF COURSE, SHE IS THE BEST” was what I told my computer at the time! With what you have done for others, with your passion, you deserve every bit of all of this great news that keeps coming to you! Congratulations, you really are beyond amazing! WOW, congratulations! What a huge dream and accomplishment! Congratulations on the NYT best sellers list, and the baby! Meanwhile, I’m not pregnant, but I feel like I need that banana split in my belly right now. I’m going to have to add in another workout this week to help justify it! Thanks for sharing. Holy congrats! Such amazing news, and so well deserved – I’m a long time reader of the blog and a new owner of your cookbook and love what you do. Congratulations! You and your book so deserve this. Your recipes are pure genius. Congratulations! So happy to see all your hard work resulting in well deserved recognition.Kudos to Eric for being such a willing tester for all the wonderful recipes too! WOW. This is such a pretty sundae!! I love it! Now, on to the sundae. A big, fat YES PLEASE! Yes! I think this why your cookbook is on the bestseller list. 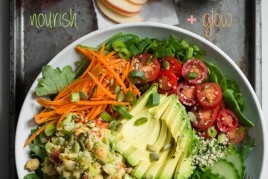 You’re spreading the light & love of good, compassionate, healthy food in such a beautiful way. I’m so happy for you. Now, please, please tell me (or maybe you have in another post? ), have you had much fatigue or morning sickness? I’ve marveled at how much you’ve been able to do & accomplish in your first trimester. I’ve said this before, but I’m a junk-food eating slug my first trimester & there’s nothing I can do about–I’ve done it 5 times, & every time I have this hope that “this time it will be different” but it never is. Also, you are positively glowing in those pregnancy pics you shared earlier (no pun intended). Congrats on making the NYT best seller list. It couldn’t have happened to a more deserving person. Thank you Janae, you are too kind my dear! I had a rough first trimester in terms of extreme fatigue and all-day nausea. Those were my biggest complaints and I’m still struggling with it right now, but a bit less severe. Some days I could barely peel myself off the couch. I’m so happy the first tri is over though! I’ll be writing about my experience in an upcoming post. NYT best seller list? That’s amazing. This sounds silly since I don’t actually know you, but in all seriousness, you’re absolutely remarkable and deserve every bit of success coming your way. You just seem so humble about everything, and apart from having many of the most delicious recipes I’ve tried, your passion and compassion shine through on your blog daily. Major hats off to you, and all of your readers celebrate your success with you! Anyway, this banana split looks to DIE for, and I’m seriously questioning if I ever need dairy again. “I’m pretty sure he’s also nesting” that’s hilarious! I can’t wait to see if Eric does…especially because we are moving soon! Having just discovered your blog I am a bit late to your party but WELL DONE YOU. That must be an amazing feeling and it’s hard work keeping a blog together as well as everything else (I KNOW) so congratulations. I loved reading about your reaction. And this banana split looks delicious. How is it possible to make a medjool date anything without eating them first? Congrats! I am not surprised to hear about the news since yesterday my boss came up to me and said “Jen! I found this great new cookbook that is totally up your alley! I made this green monster…” I knew right away she picked up your book. XD I can safely say I adore your site and I love how great each recipe is. There are so many blogs where I made a recipe with disappointing results. Never here. Congrats, Angela! That is amazing! I just wanted to say that you have been so inspiring to me over the past few months. 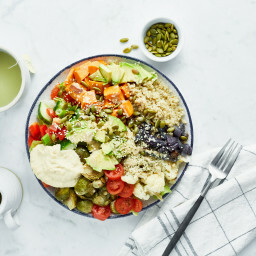 I am currently in treatment for EDNOS and was looking for a healthier way to eat. My doctor wants me to eat more healthy fats several times a day but had no clue how to do it. I had gone so low fat that I lost about 1/2 of my hair! I’ve been making your recipes and they have been helping so much – I made your dreamsicle smoothie just this morning with extra avocado and it was so good! Thank you for putting your story out there and for inspiring me and so many others. Thank you also for providing recipes that are healthy and not restrictive like so many other bloggers. I appreciate it more than you can imagine. I’m so happy to hear you are on the road to recovery Ali. You deserve all the credit for your progress, but I’m happy that I could play a part in your journey! Good luck with everything! Congratulations Angela!!!!!!!! That is seriously awesome, amazing news! Take in the moment- that is such a wonderful accomplishment. Thes split looks amazing and the pictures are gorgeous. Bravo! Congrats!! Totally the top-rated cook book in my collection too these days!! 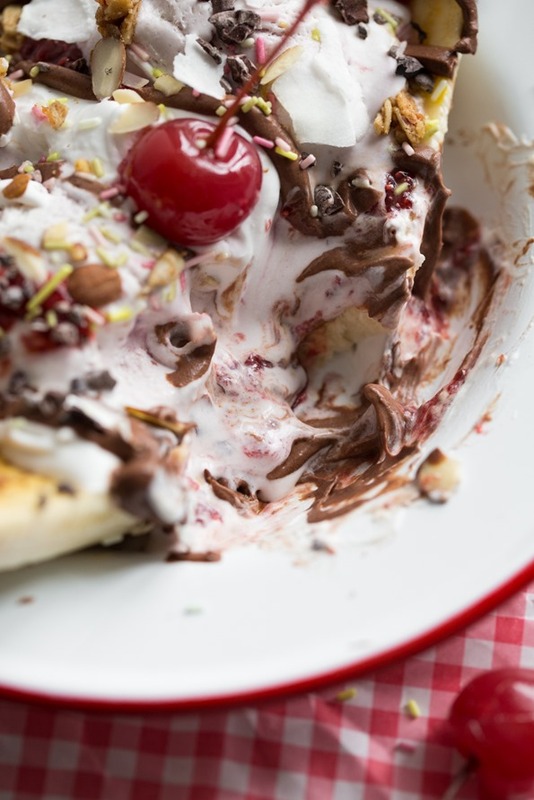 The banana split looks great…makes me want hot summer days to get to Wisconsin!! Congratulations! You really deserve it. You’re book is wonderful. I can’t say I am surprise! Your recipes are amazing and I bought your book as an early birthday present as I couldn’t wait any longer and knew it wouldn’t disappoint. Congrats on all your big news! Thanks everyone for your congrats! Congratulations regarding both the book AND your pregnancy! Your inspiring yet simple recipes, along with the gorgeous photos inspire EVEN ME to get cooking. I have yet to try one that I or my non-vegan boyfriend didn’t devour! Those vegan banana splits made my heart race when I saw them on Fork and Beans last week! Lucky you got around to making them before me…I gotta get to work so that I can have a vegan banana split too!! Well done, Angela!!! Absolutely deserved!!! Angela, this genuinely renews my faith that every once in a while, good things happen to people who truly deserve it. You are a bright little light in the world, and I am so happy to see that light reflected back on you! NYT best-selling author. What an accomplishment. Bought your book last night, not even vegan!! I have been following your blog for years and have made A LOT of your recipes, not one of them was a fail. Not even once. Not a massive fan of buckwheat porridge but that’s personal preference, haha. What I love about vegans is the conscious effort to cram as many healthy things into something as possible. This is what keeps me coming back! Sounds like an exciting year for you! Congrats Angela!! I have been a huge fan of your blog and can’t wait to get your cookbook! Congrats too on the baby news! How exiting! I have been especially blessed by your blog this past year as I have been battling thyroid cancer. I am a young mom in my late 20s. I have had many challenges this year with my cancer but your blog had been such a fun distraction and outlet for me. Cooking and baking is my stress relief and I’m a big believer of vegan eating. I have told so many about your blog! Anyways thanks again for sharing such wonderful and healthy recipes with all of us and congrats again on the baby and cookbook!!! Congrats Angela! Well deserved!! 2014 looks to be such an exciting year for you! The banana split looks delicious! Congrats- I am loving my cookbook! Congrats! I’m not surprised. 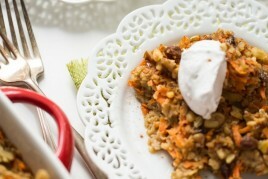 Love your cookbook and have been enjoying your recipes from it and from your blog. I am definitely trying this one too! Well-deserved!! WOW!! I am proud to say I am the owner of your fabulous cookbook! Question unrelated to today’s post —- Superseeds. I ordered a 10lbs of chia seeds from them back in early February, based on your recommendation of them and after price checking Bulk Barn prices vs theirs (I live in NS). Unfortunately, no chia seeds yet. I’ve emailed them 3x and called countless times and left messages… nothing. I’m starting to think they’re a scam! Have you ordered from them recently? If you don’t mind emailing me back to let me know what yor experience with them was like, I would appreciate it greatly. If you haven’t ordered from them recently, you might want to consider taking them off your blog recommendations…. Thanks Angela! This looks good. Sometimes vegan recipes can look bland. But this looks amazing. This looks super yummy and sounds super yummy!!! Congratulations, Angela!! So incredibly well deserved. And it makes us all plantbased peeps proud that a vegan cookbook can reach that high. It really is a great sign for this growing community. Congrats Angela! I’ll be making my first dish out of your book this week! Also any Starbucks in the GTA on Sundays will sell the New York Times! Congratulations on this incredible achievement! Not only is it wonderful for you, personally, it’s also a victory for the animals who are spared by your plant-based readers. Win-win! I am glad to hear since you are truly deserving of this accomplishment. My son is five and he even knows your blog because I am on it daily kooking for my next meal. It is your blog that kickstarted my journey once again and this time I know I will be successful because your recipes are great. Thank you for all you do! Congrats on your success, Angela! It’s obvious that you’ve worked incredibly hard, in addition to being super talented. Enjoy!!! I was expecting you to land on the bestseller list – well deserved! And what makes it even better is the beginning of this story – how you took the leap of faith, left a job that wasn’t right for you, and you WENT FOR IT!!!!! Boy, has that ever paid off. I LOVE your recipes, but how you changed your life is even more awesome – in fact, it brings tears to my eyes and it inspires me on my own journey. So happy for you!!!!! It’s an amazing news. And you deserve it. Your story is inspiring and your recipes are delicious. I need to say thank you for changing my life with your amazing book and blog. This is the most beautiful cookbook I’ve ever owned. I can’t wait to cook something from it Tonight! Congrats!! Awesome! As a writer that is my dream in life–to make the bestseller list. Even better that it is a vegan cookbook, to spread the love. :) Date chocolate sauce looks spoon-worthy too. Congratulations!! I love everything about your cookbook. A well deserved accomplishment! I’ve been following your blog about 6 months now, I feel like you’re my friend, I’ve caught myself wanting to spread the wonderful news of your book success and pregnancy to my real life friends. I am loving every single recipe we have tried so far (20 at latest count) there are a few which we have made several times already. One of our favorites is the Classic Glo Bar. I’ve made them at least 4-5 times but today something thing didn’t go just right and they wouldn’t stick together. No worries, in a bowl with some freshly made Almond Milk saved the day. My kids would like me to goof up again. Congratulations for the success of your book!! You have worked super hard for it and you deserve it! Hi Angela, congrats on making the list!! And thanks so much for inspiring us with your super delicious recipes – I am def. going to try this banana split this week!. Your cookbook is on my wishlisht for my birthday.. I’m secretly hoping you’ll be posting some tips for eating healthy (vegan) through a pregnancy with do’s and don’ts or something like that :) A lot of people seem to think that that is not possible, which is so not the case! You make a great example that a healthy vegan lifestyle can be carried on through a pregnancy! Congrats, Angela! Both on the baby and on the book, you deserve it! I just got my own copy of the Oh She Glows cookbook! I haven’t had time to read it through, but I’m loving it!!! Your recipes are amazing, and the photos… WOW! Just makes me want to cook everything in the book!!! Wish you the best! Congratulations! Thank YOU for making vegan meals so fun and tasty! It’s really a great and useful piece of information. I’m happy that you shared tis helpful information with us. Congratulations Angela! You deserve it! Such great news. I’ve been following your journey for years & I’m so proud of you. You are an amazing lady and you have inspired me in so many ways! Peace to this new journey. Congratulations Angela! You definitely deserve every success you have! You inspired be so much, I even started a blog after seeing yours! Congrats again – i’m glad you’re celebrating with a big vegan banana split! Congratulations! I also live in the GTA and my mom bought me a copy of your book as a present for doing well in my first semester of college. Congratulations, Angela! That’s wonderful news! Congtatulations! Well deserved! I hope that you will be signing copies in Ottawa when your book tour is re-scheduled! Congratulations on making the NYT bestseller list. I literally got chills reading your blog. Wonderful to receive the recognition for your hard work and creativity and for being the inspiration to others that you’ve been for me. Amazing! You are so inspiring. Congrats!! You deserve it more than anyone else! I finally received your book a week ago (takes a long time to ship to Denmark), and I’ve been making so many of your recipes already! They are absolutely delicious. My roomie and I have just been munching on cake, granola and eaten tons of tomato soup. She loves your book too, and we really enjoy cooking your recipes together at night. So much more fun than studying ;) And what we also love about your cook book is that we already have many of the ingredients in our kitchen, and even two students like us can afford to make all the food (and buy it!). Oh, and even my parents liked your tomato soup (and they usually just hate vegan food, though I think it’s just in their minds they hate it, I mean how can you hate it?! ), so thank you so much for making them eat just one vegan meal! I almost cried because I was so proud of them (and you for creating the recipe – convincing my parents is a really good job!). And the banana split looks sooooo good! I’ll make it next week to my roomie and me. It’s the perfect excuse to a break from my exams. I see banana split and a movie night ahead, and absolutely no homework! On a completely different note. Do you know if regular cocoa powder is vegan? I usually buy carob powder but I don’t love it in baked goods. What do you usually use if you don’t use carob powder? Raw cocoa is really expensive in Denmark, so if there’s an alternative that a bit more affordable that would be amazing! And congrats on being pregnant. I am so happy for you and Eric (and Sketchie), and you look so happy and beautiful in the pictures. You always put a smile on my face. Oh, and should you ever need a nanny (or someone to entertain Sketchie when the little new comes) just say the word and I’ll fly to Canada! I love children, animals and Canada so it would be perfect. And an excuse to travel to your very beautiful country (you are so lucky to live in such a beautiful country!). Sorry for the long (and weird) comment. Perhaps I got a bit carried away. Anyways, have a wonderful weekend! Congratulations! Well-deserved. Your recipes are amazing. The cookbook is a visual delight. Congratulations! What a huge accomplishment and very well deserved. You are an inspiration to many. Congrats, that’s awesome news! And this looks amazing as always! Congratulations on your well deserved spot on the NY Times Best Seller List!! I am loving the new book and have already given it to 3 people! I want to share it with everyone ~ and, in fact, am telling my FB followers all about it as I post photos of meals created from your book! The flavors are amazing and the results are beautiful. You have made cooking fun again- at least for me!! I am a loyal follower of your blog, anxiously awaiting a new release :) This banana split one will be a delight and I can’t wait to make it!! Thanks again for your wonderful work and for making so many of us (and our families) happy. Looks like a big bowl of fun! Delicious and extraordinary! Your life is filled with wonderfulness! Congratulations! THAT IS SO EXCITING! Congrats, you deserve it. And holy crap, this looks amazing! Congratulations on EVERYTHING!!! You have been giving freely of yourself and now the universe is hugging you back. All the praise and success is well deserved. Congratulations Angela! I can’t say I’m surprised though ;) Although I’m sad I haven’t been able to afford to treat myself to the book yet (I had totally planned to pre-order, but that couldn’t happen), I’m so excited about being able to gift it to myself as soon as I have a little more disposable income, and you can bet I’ll be buying multiple copies for friends and family, so your sales aren’t going to drop anytime soon! 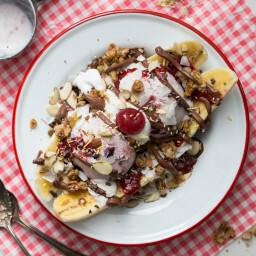 This recipe looks fabulous, I’m such a sucker for banana split! Congratulations! You are accomplishing so many great things! This chocolate sauce is sinful! Thanks for sharing – my kids love it. That’s bananas! Big vegan banana split bananas awesome. Hello from Vancouver! Congrats on the baby, I’m very happy for you :) Do you know if its a boy or a girl ? Do you have any names in your mind ? So exciting! I had no idea that you and Eric bought another house. Did you end up buying in GTA or somewhere else? I remember you two were questioning where to live. I’m really curious what you have decided. Congratulations Angela! So happy for you :) And hubbaa hubbaa this banana split looks amazing!! :) Can’t wait to try! The chocolate date sauce is to die for!! It will definitely be a new staple in my house. Thank you, and congrats on all of the book and baby excitement! I ordered your cookbook today! Congratulations on your book being a best seller! I absolutely love your cookbook, it has quickly become my favorite. I can tell you put so much thought and intent behind every recipe and picture. It is everything I would want out of a cookbook, and it inspires me to eat more healthily. It is beautifully put together and what I have made so far is delicious. :) Your book deserves to be a best seller! So proud of you!, but I am not surprise, your book is beautiful and the recipes are awesome! I have already tried a few recipes, cannot wait to make the rest of them!! Congratulations you well deserve it! Congratulations Angela that is more amazing news, my oh my, what a wonderful year for you, ! Congrats on the book and also I think you are having a boy: savoury cravings and you actually glow! You always look better when pregnant with a boy. Will you find out? You inspired me to make this yesterday as a food-companion for a programming lab I was working on, and let me just exclaim, THE CHOCOLATE SAUCE. You might as well have just made a post only about the chocolate sauce, because it is THAT GOOD. I am eating it with a spoon straight from the fridge the next day for breakfast. I truly think it is the closest vegan Nutella copycat I have ever tasted, and it doesn’t even use hazelnuts (which I’m allergic to anyways!!!!) And I’m positive it’s a lot healthier than Nutella, too. Wow, I just want to rave about this sauce to everyone, everywhere. THANK YOU! hahaha I’m glad I’m not the only one eating it with a spoon! Seriously! Coconut Bliss is my FAVE brand of coconut milk ice-cream for sure. We buy it ever week (oops!). So, I foresee this b-split in my very near future (is it ok for me to have post-pregnancy cravings? Might be more justifiable than Eric’s haha)!! First off, Congratulations! I can’t wait to read the OSG cookbook! Currently sitting in my study abroad classroom–bored–I am now seriously craving this banana split. I will have to wait until i return to the states in 5 weeks, but this will definitely be one of my first indulgences! I’ll wholeheartedly affirm spousal pregnancy cravings. I had to step up my workouts when my wife became pregnant with #2. For our first baby, I timed an intense 90 day workout (P90X2) to end shortly before our due date. It was awesome being in the best shape of my life prior to those challenging first few months. It really helped me be on top of things while I took care of her, the baby, and the house. Angela – congrats! I checked your cookbook out of the library, and I have already made six recipes! Yours is a cookbook I definitely plan to buy! Your recipes are so simple and easy to make. I can’t wait to make every recipe in the book! Incredible news! OMG! Wonderful vegan mainstreaming and so amazing. Congratulations!! Congrats Angela! If you have any trouble getting a hold of a copy of the NYT, shoot me an email! I am not in the NYC area, but I know that I can get a hold of it in Boston and send it your way. Congratulations! So well deserved! I’m so happy for you. Something completely different: in the ingredientlist there’s vanilla extract. Please beware of the alc. content. During my first trimester I drank a lot of smoothing with vanilla extract in it. Only after weeks I thought about the alc. in the vanilla extract. Congrats on the baby and the best seller list! I’m fairly new to your site, but it has been an inspiration to me already and is quickly becoming one of my favorites :) I have yet to purchase your book, but am looking forward to it in the near future. This sundae looks SO GOOD!!! I know my congrats is coming a bit late, but I just wanted to congratulate you on a huge accomplishment. I just ordered your book and cannot wait to go through it! Hi Angela! I absolutely love your recipes and your cookbook is a go-to for me, especially when my sweet-tooth is aching ;) I had an idea for a potentially simple but fun recipe post for you: a vegan and low-sugar ice cream float! You can use vanilla-bean coconut icecream and Zevia pop (they have a delicious Root Beer flavour!). I’m sure your creative mind could think of ways to spruce it up, too :) Maybe some coconut whipped cream on top? I made a decision one week ago to become vegan. The research by T.Colin Campbell, PhD convinced me that this was the way to go. 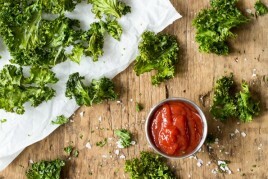 He did the China Study on plant-based eating with other researchers over a twenty year period. I was thrilled to see your book in the store today. The recipes and photos are amazing. I am so looking forward to eating vegan and following your book. Thak you for writing it. It makes vegan look really accessible All the very best to you and your family. You are my idol. Enough said. This was amazing. I want to eat one everyday. No, I want to only eat that forever. That chocolate syrup… I MEAN WOW.